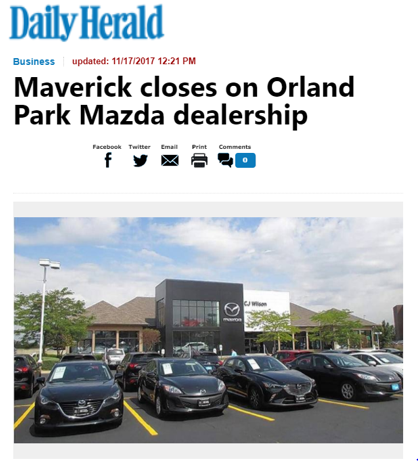 Maverick Commercial Mortgage Inc. recently closed a first mortgage loan on a 22,000-square-foot automotive dealership in Orland Park, according to Maverick President Benjamin L. Kadish. The property is a dealership occupied by CJ Wilson Mazda. Improvements on the 3.32 acre site were completed in 2003 and renovated in 2017. CJ Wilson operates two automotive dealerships in the greater Chicago area, four in California and one in Arizona. Eric Vates is vice president of CJ Wilson Mazda and oversees all aspects of dealership operations. The 5-year, fixed-rate loan amortizes over a 20 year schedule. Proceeds from the loan refinanced the existing first mortgage and paid for closing costs. The loan was funded by a local lender. This was the third loan Maverick Commercial Mortgage closed for the borrowers in 12 months.